At Two Rivers Law P.A., our attorney, David Cox, is there to deliver aggressive defense for people charged with crimes in Otsego, Minnesota. For over 10 years, our law office has helped clients avoid penalties, including jail time, fines, driver’s license suspension and probation for a broad array of allegations. Although we are often able to obtain the dismissal or reduction of charges without going to trial, as experienced litigators, we are never afraid to pursue the best possible outcome in court. We also offer niche counsel for families during the stepparent adoption process. Whenever necessary, our attorney intervenes in cases involving Children in Need of Protection or Services. Acting in the best interest of children, we defend clients against CHIPS charges and educate parents on their case plan requirements. When our firm is not finding solutions for criminal and family matters, we are doing so for business and real estate transactions. Our attorney not only negotiates contracts but also handles disputes involving construction, boundaries, purchases, sales and leases. If necessary, we represent clients in general litigation. Whether their cases are in the cities of Elk River, Anoka, Rogers, Monticello, Big Lake, Princeton, Buffalo or Maple River, we invite prospective clients to meet with us at our law office for a free initial consultation. We also offer legal assistance in the greater counties of Sherburne, Anoka, Wright and Western Hennepin. 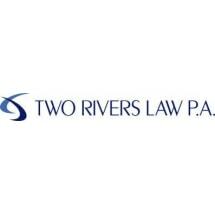 Two Rivers Law P.A. accepts credit cards as payment.